THE teenage son of murdered Limerick businessman Jason Corbett (39) has posted an emotional musical tribute to his late father. 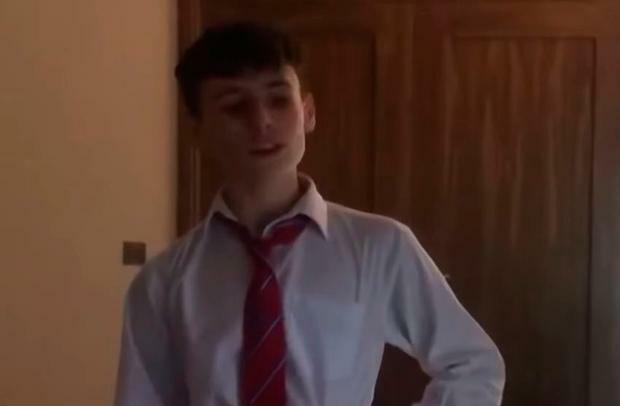 Jack Corbett (14), who is a talented singer, musician and rugby player, posted his version of 'Dancing in the Sky' as a Christmas tribute to his father and in remembrance of his late mother, Margaret 'Mags' Fitzpatrick. "This is dedicated to my Mam and Dad, Mags and Jason Corbett, and to anybody out there who has lost a parent," he posted in a moving dedication. The song and video clip were posted on YouTube - with tributes flooding in to the teen for the courage he has shown. Jack is a keen music fan - and regularly performs and composes material with Ed Sheeran being one of his favourite musicians. The Limerick student was just two when his mother died from an asthma attack in 2006 - and was almost 11 when his father was brutally murdered in North Carolina in 2015. Jason Corbett was murdered by his father-in-law, Tom Martens, and his second wife, Molly Martens, as he slept in bed at his luxury home at Panther Creek Court in August 2015. Both are now serving 20-25 year sentences after being convicted of second degree murder by a Davidson County jury in August 2017. They are both now appealing those convictions. The Corbett family have maintained the packaging industry executive was attacked because he had been planning to move back to Ireland with his two children, Jack and Sarah, amid increasing concerns over the bizarre behaviour of his second wife. Ms Martens, who is from Tennessee, has a history of mental health problems and had been demanding that her husband sign adoption papers so she would have equal rights to the two children by his first wife. Her father, a retired FBI agent, had also been pressing Mr Corbett to sign the adoption papers. Mr Corbett and Ms Martens met when she travelled to Ireland to work as a nanny/au pair in 2008. She came to Limerick to look after his two children in the aftermath of his first wife's death. Ms Martens subsequently became obsessed with the two children - and visited a divorce lawyer to determine her rights to them within weeks of marrying Mr Corbett at a US ceremony in June 2011. Mr Corbett have moved to work in the US after Ms Martens had insisted she was homesick in Ireland and wanted better opportunities for Jack and Sarah in the US. Following a bitter custody battle in August 2015, a US court granted custody and guardianship of the two children to Tracey and David Lynch, Mr Corbett's Limerick-based sister and brother in law. The couple then waged a courageous battle for justice for Mr Corbett over the past three years.